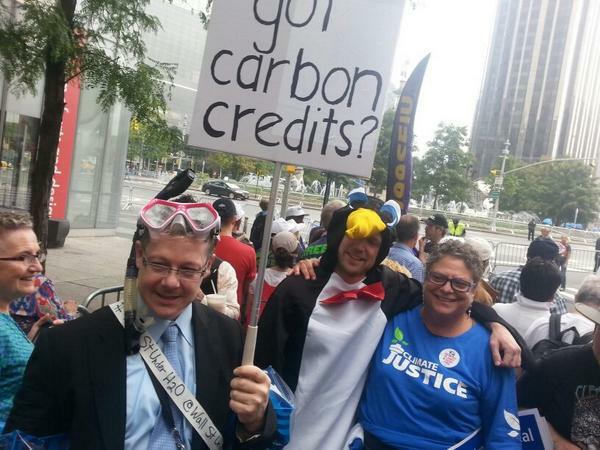 Crowds gathered in downtown Manhattan on Monday to stage a protest to draw attention to climate change. Sunday's march in New York drew hundreds of thousands of people and was one of 2,646 events in 156 countries calling for action. 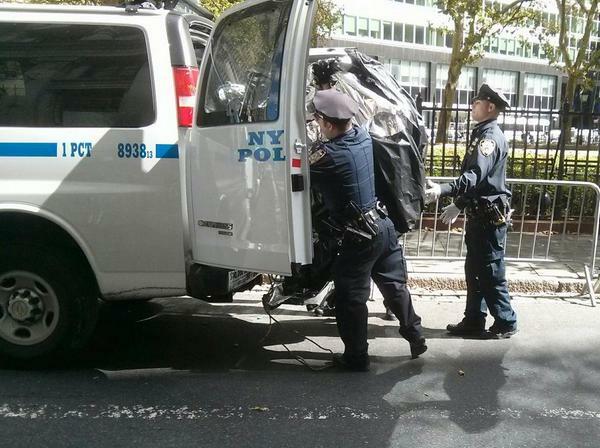 The NYPD confirms to BuzzFeed News that 102 people were arrested on Monday near the intersection of Wall Street and Broadway. 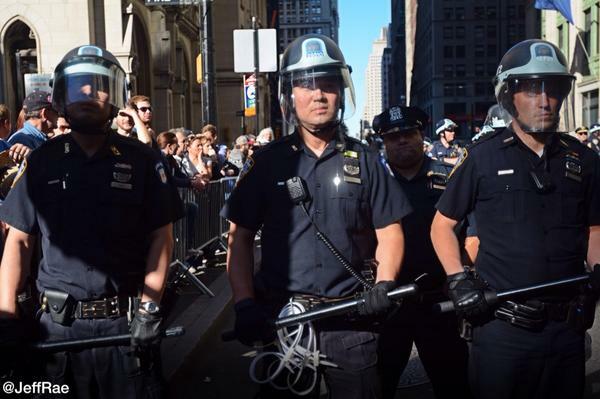 Then NYPD confirmed to BuzzFeed News on Tuesday that a total of 102 people were arrested after Monday's Wall Street protests. Police were unable to say how many of those people had been released. AJ+ posted video to Twitter that shows an NYPD officer using pepper spray on a crowd of protesters. The NYPD confirms to BuzzFeed News that two people have been arrested so far near the intersection of Wall Street and Broadway. 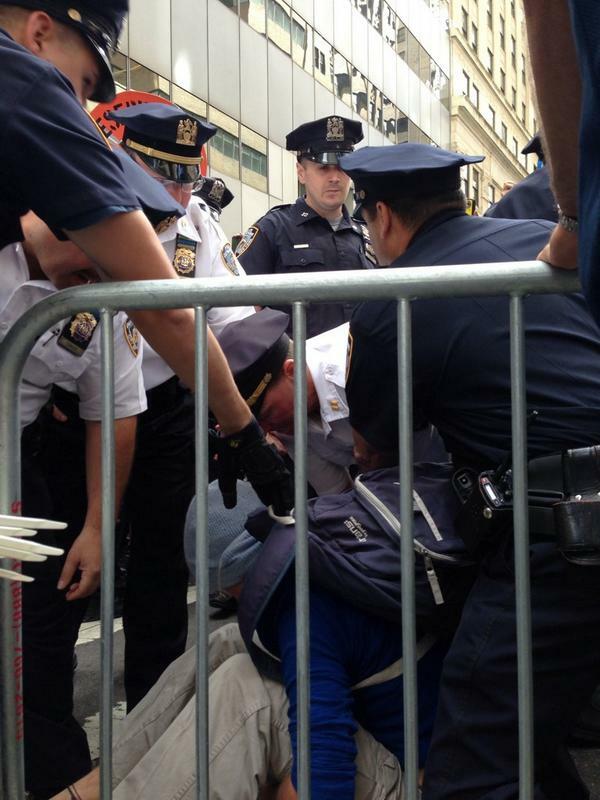 Police clash with protesters as they try to remove a barricade near Wall Street. 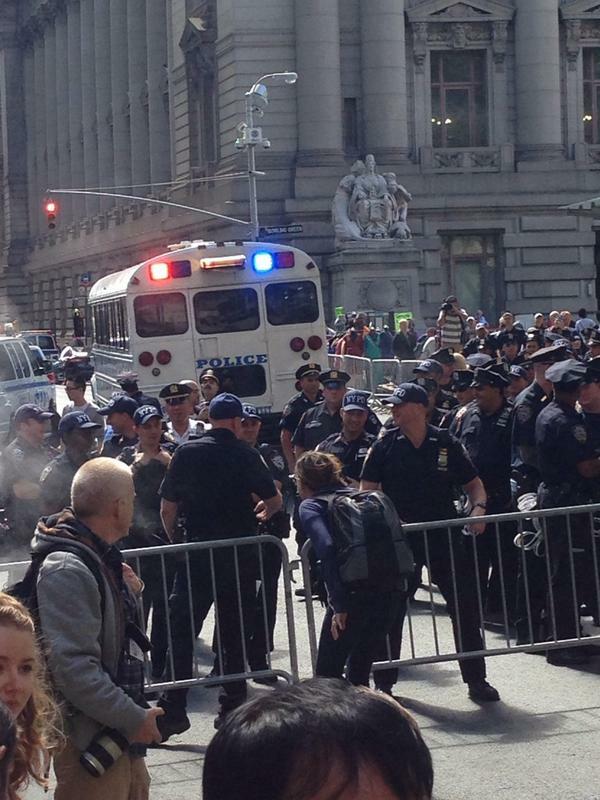 There are unconfirmed reports of pepper spray being used by NYPD officers. Police in riot gear have been deployed to the scene. 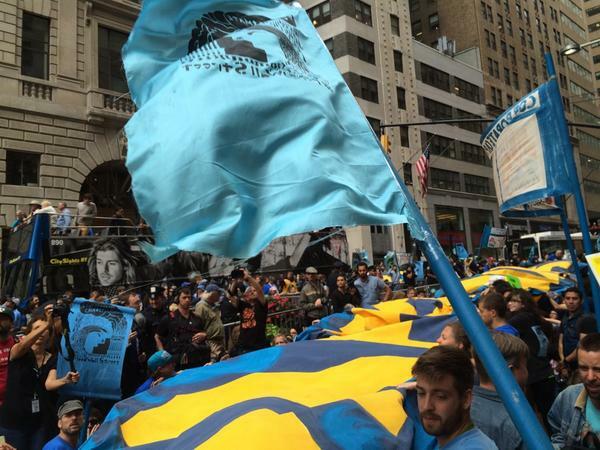 There are reports that the protest will leave Wall Street after the closing bell and march uptown to the United Nations building. And now pizza. One protester said that they plan to stay until 4:30 pm then, if no arrests, relocate to UN. 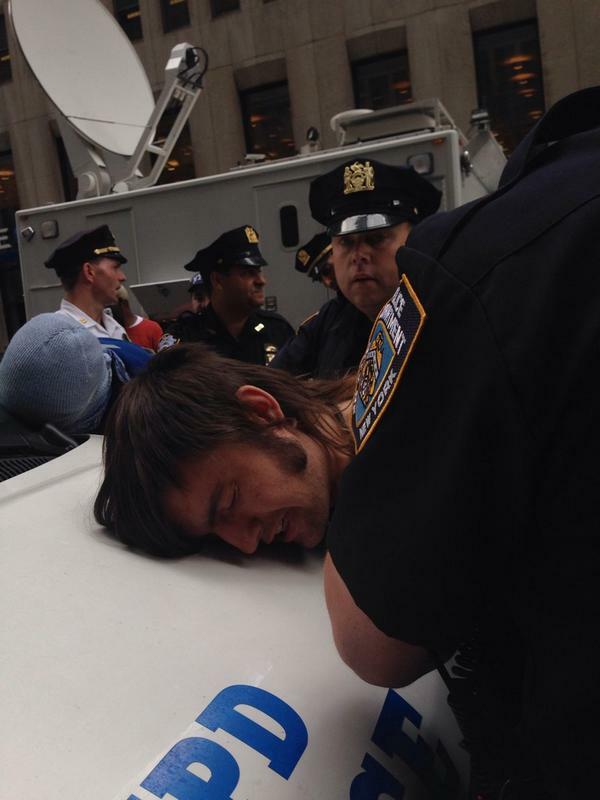 NYPD arrest a protester at the "Flood Wall Street" demonstration in lower Manhattan. Newsweek's Zoe Schlanger identified the man as Industrial Workers Worldwide union member Elliot Nelson, 25, from St. Paul, Minnesota. 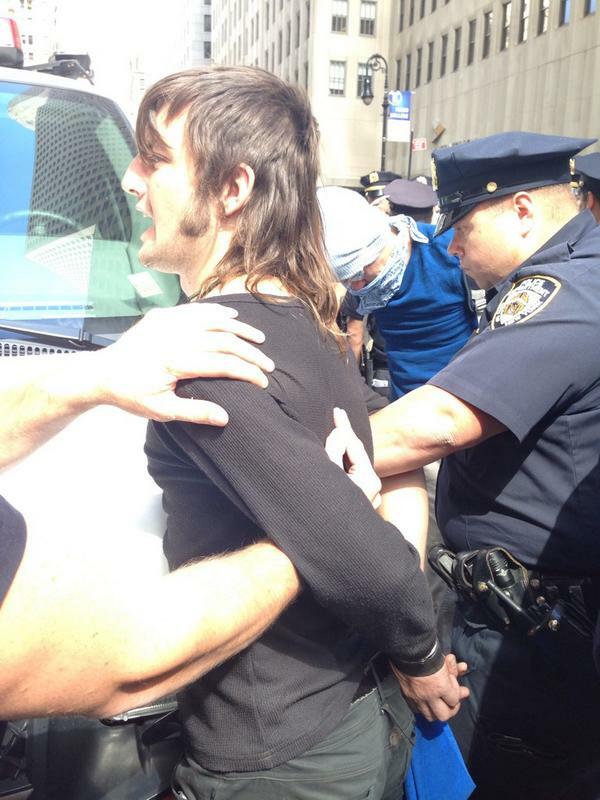 NYPD appear to begin arresting protesters. Guy arrested says "I&#39;m being tortured. I was tortured in 2008." NLG taking notes on handcuffs. Guy arrested says "I'm being tortured. I was tortured in 2008." NLG taking notes on handcuffs. Elliot Nelson, 25, is from St. Paul. He&#39;s a Industrial Workers Worldwide union member. Elliot Nelson, 25, is from St. Paul. He's a Industrial Workers Worldwide union member. 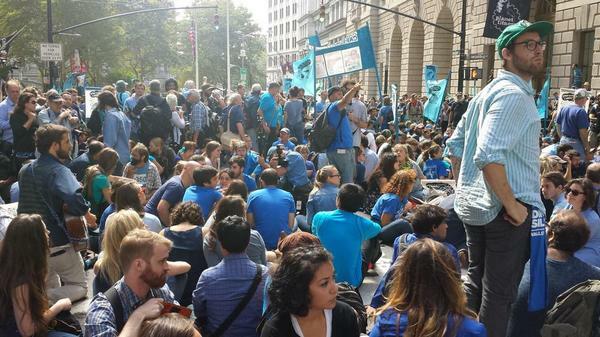 #floodwallstreet crowd settles down with sitdown after arrests. 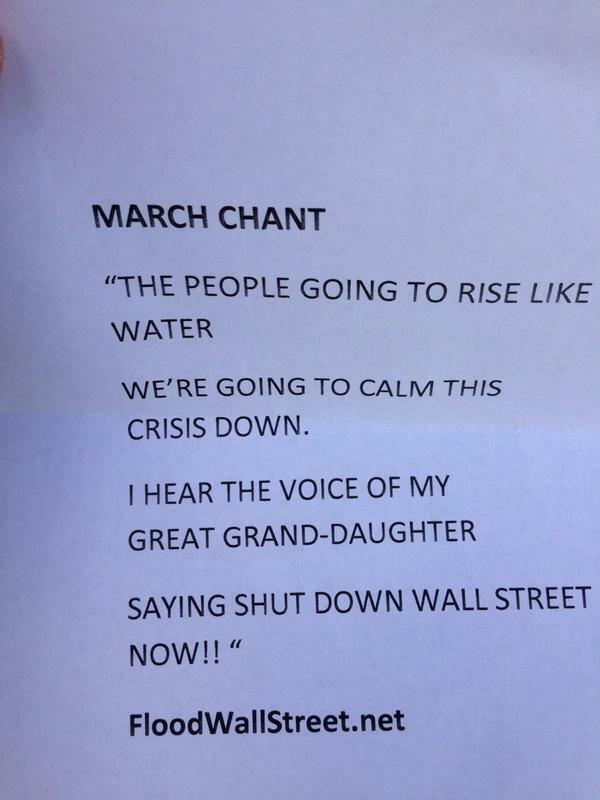 Protesters break out a rendition of Twisted Sister's "We're Not Gonna Take It." A few cops just saw people trying to pull apart barriers. They came over and re-adjusted them calmly, didn&#39;t so much as chastise anyone. A few cops just saw people trying to pull apart barriers. They came over and re-adjusted them calmly, didn't so much as chastise anyone. Protest is peaceful thus far as demonstrators and police meet near Wall Street. 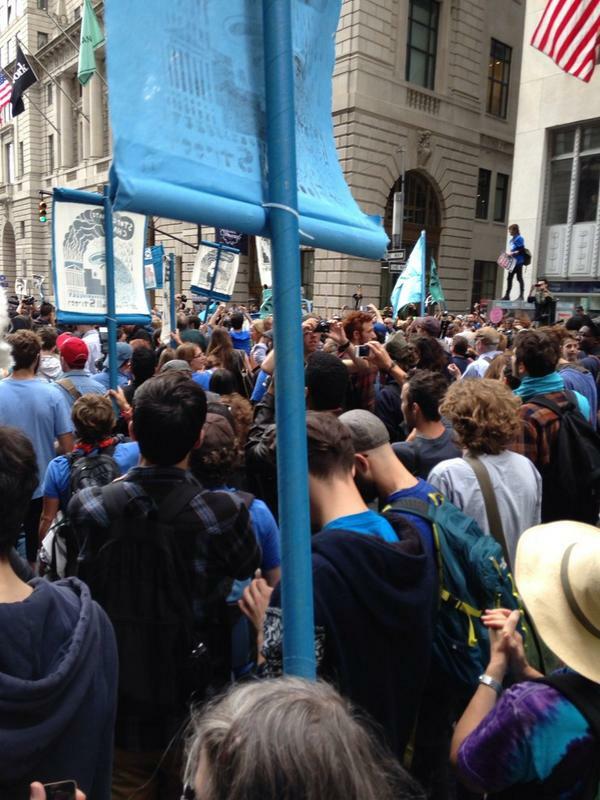 Broadway still blocked by #FloodWallStreet peaceful so far, no arrests as far as I know. Sit in at bull. 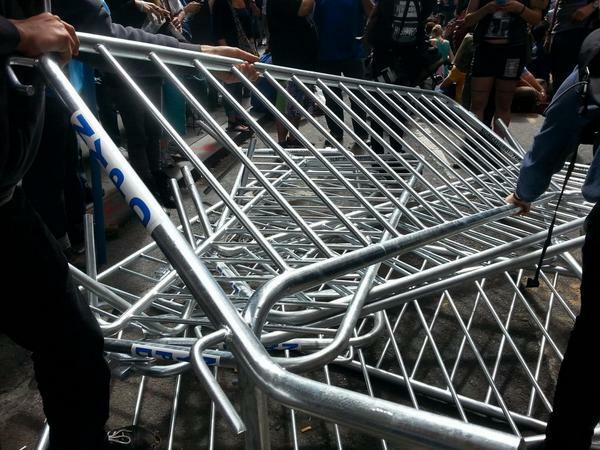 NYPD just sealed the barricades, time for me to hop out. 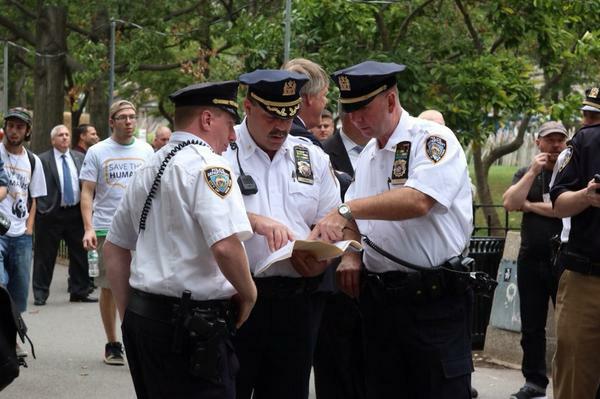 NYPD plotting before the #FloodWallStreet action starts. 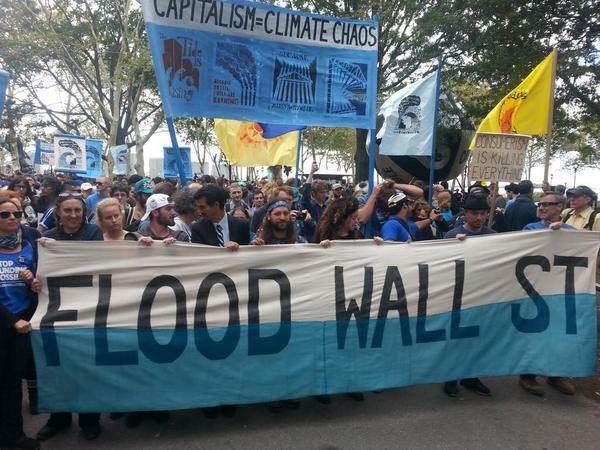 The march from Battery Park to Wall Street begins. 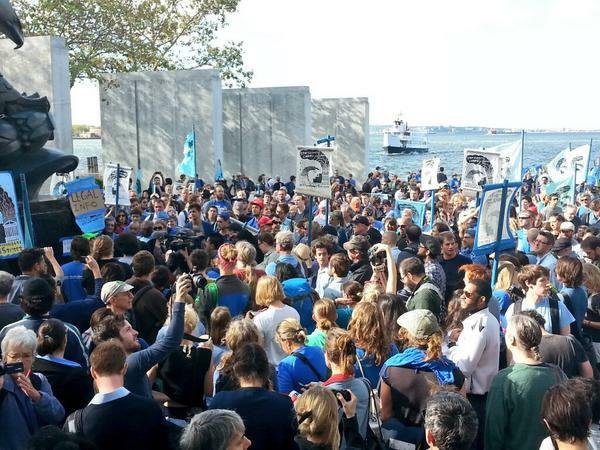 Crowds gathered in Battery Park in Lower Manhattan on Monday morning and expected to march to Wall Street where they will stage a protest for climate change awareness. 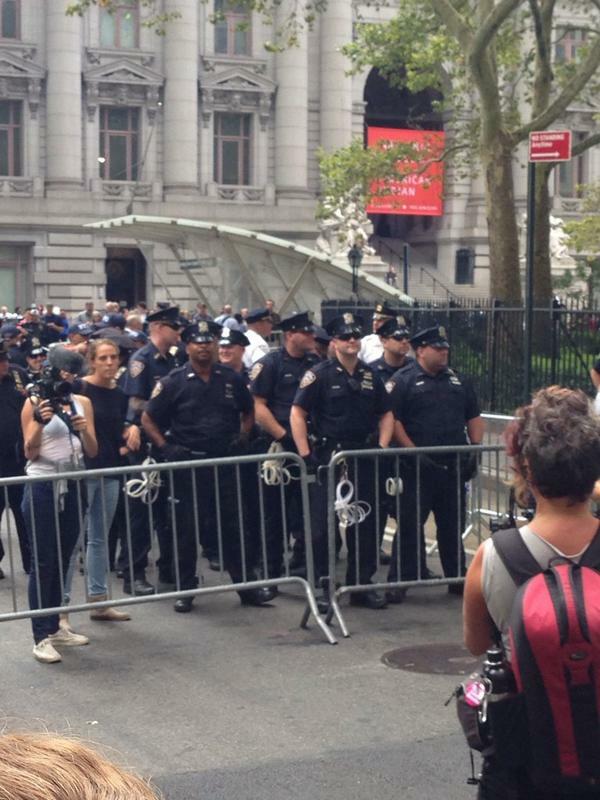 NYPD have assembled barricades on and around Wall Street in preparation to meet the demonstrators. 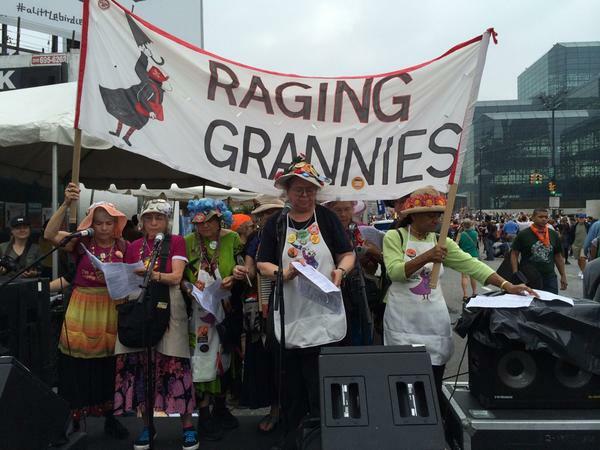 Organizers said Sunday they will occupy the street until they are forced to leave. No tourists will be touching the balls of NYC&#39;s most well guarded illicit street art sculpture, the Wall Street Bull! 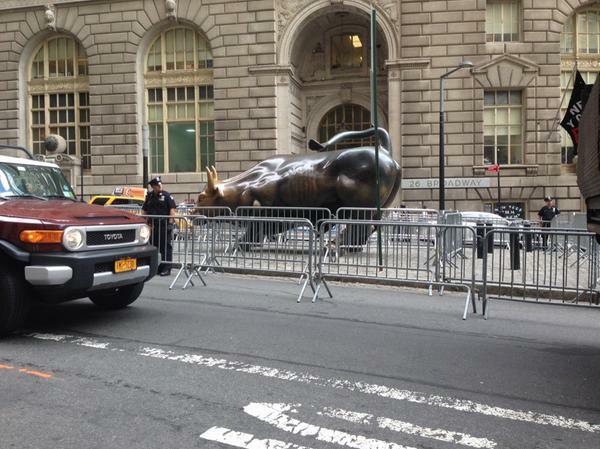 No tourists will be touching the balls of NYC's most well guarded illicit street art sculpture, the Wall Street Bull! 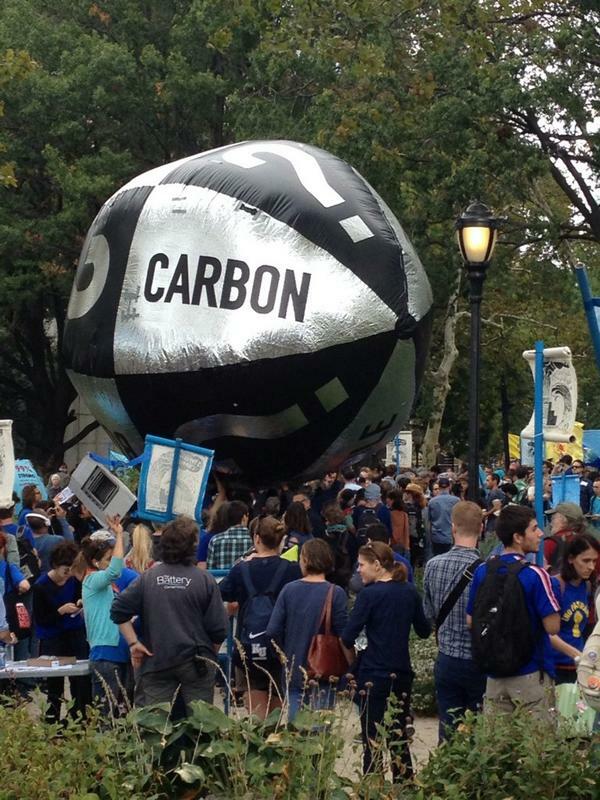 Organizers estimated that some 310,000 people joined the People's Climate March. 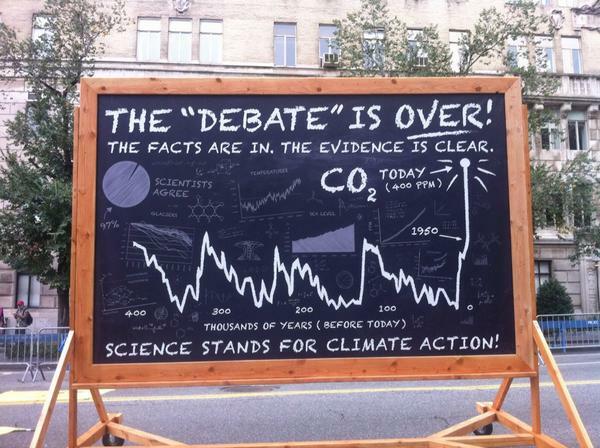 World leaders will gather in New York City on Tuesday for a United Nations climate summit meeting. 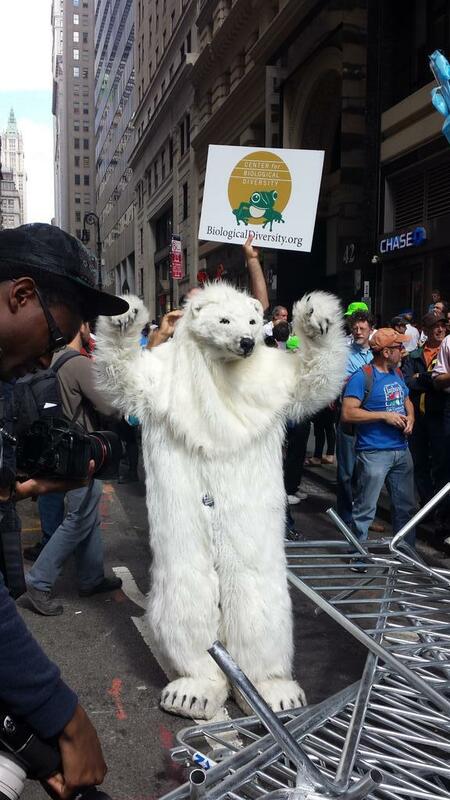 Mother Earth float along 42nd Street during the march. Aerial video footage over the march. I am overwhelmed by such a strong power, energy and voice of people - I hope this voice will be truly reflected to the leaders when they meet on September 23rd. 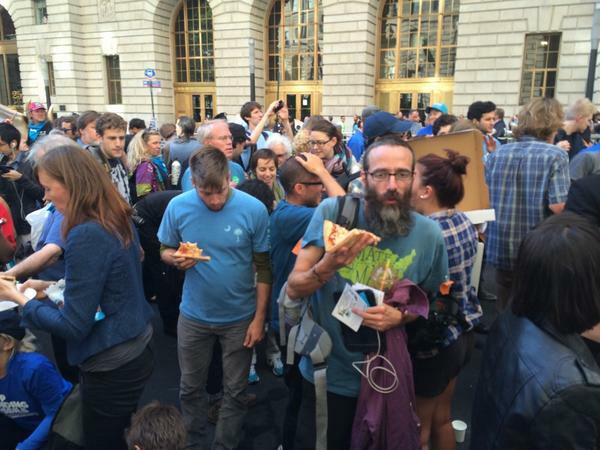 Climate change is [a] defining issue of our time and there is no time to lose. If we do not take action now, we will have to pay much more. They have raised their voice, they have shown their power to change the mind set of people and I hope that this power will help -- and the heat will help -- cool the global temperature rise within 2 degree Centigrade. 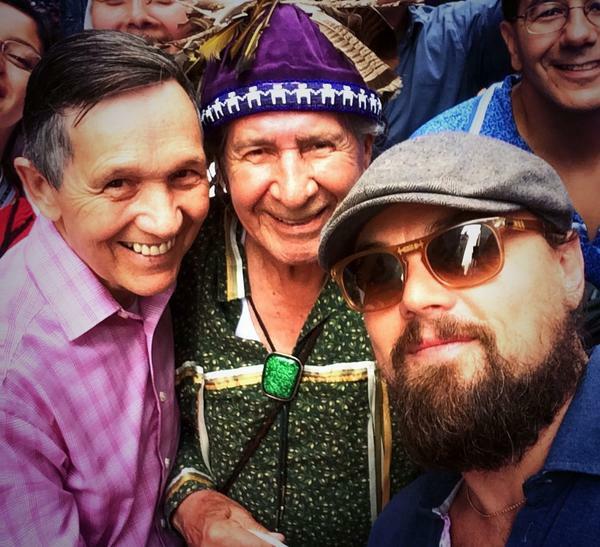 While marching with the people, I felt that I had become a Secretary-General of the people. I am the Secretary-General of the United Nations; I am now working for the people. Let's work together to make this planet earth environmentally sustainable so that our succeeding generations &ndash; children after children &ndash; will live peacefully. I am very much grateful for Mayor [Bill] de Blasio&#39;s strong commitment to make New York City a model -- by [making] climate neutral public or office buildings by 2025, and 80 per cent climate neutral by 2015. I strongly support and welcome his initiative and leadership. Organizers say on Twitter that more than 300,000 people marched today in New York City. 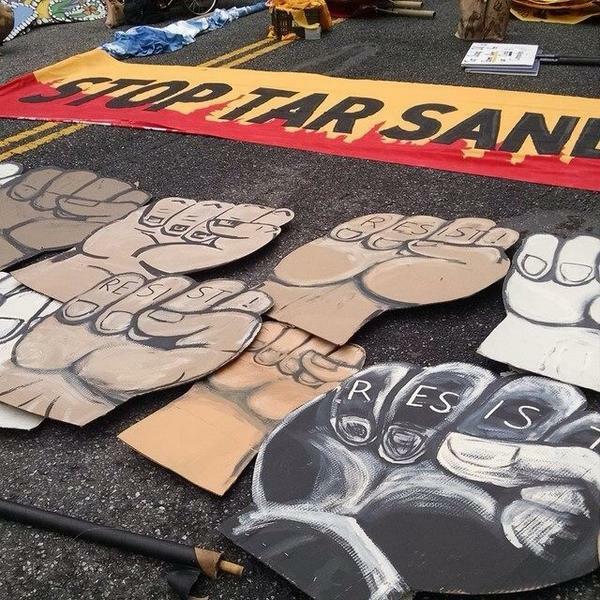 "We said it would take everyone to change everything &mdash; and everyone showed up," Eddie Bautista, executive director of the New York City Environmental Justice Alliance said in a statement. The organizers said they used a "crowd density analysis formula developed by a professor of game theory and complex systems at Carnegie Mellon University" to count the number of participants. 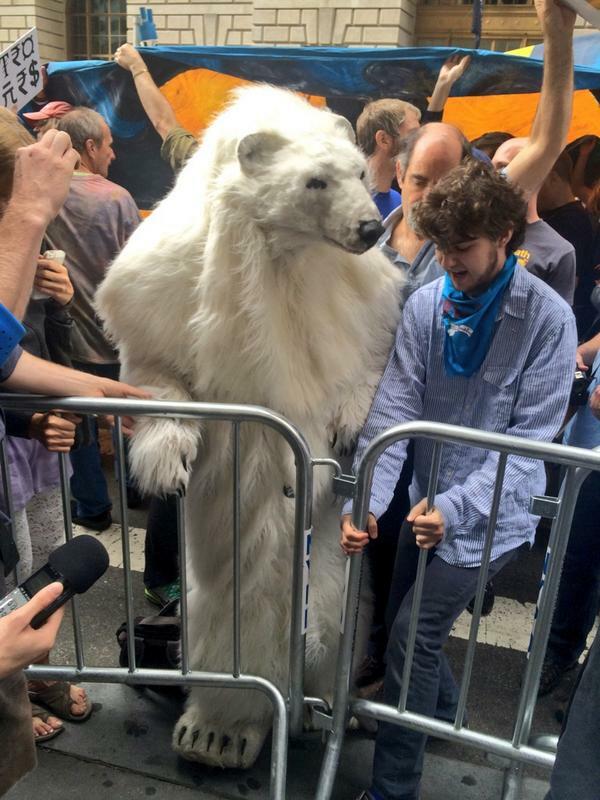 French Foreign Minister Laurent Fabius, animal activist Jane Goodall, former U.S. Vice President Al Gore, NYC Mayor Bill de Blasio, U.N. Secretary General Ban Ki-moon and French Environment Minister Segolene Royal take part in the march. Peacekeepers reporting 200,000 people at #PeoplesMarch, twice as expected. A moment of silence at 12:58 p.m. ET. 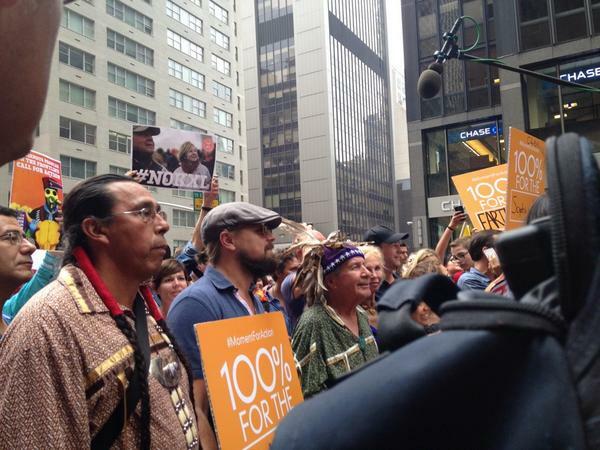 Leonardo DiCaprio marches with indigenous groups @Peoples_Climate in NYC. 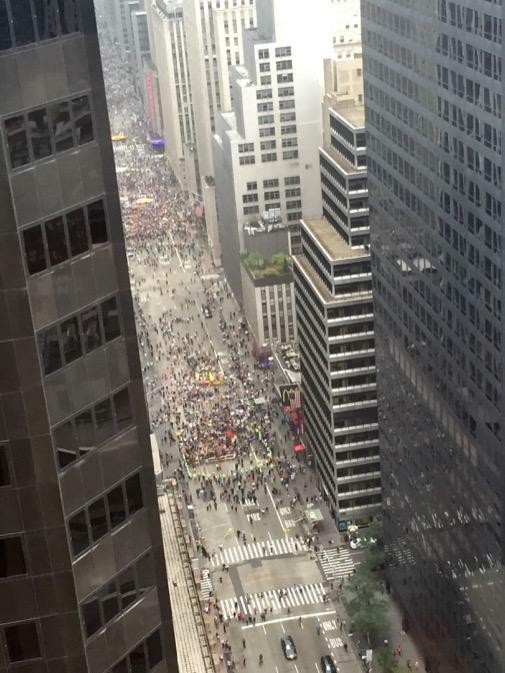 From above: #PeoplesClimateMarch makes its way down Avenue of the Americas. 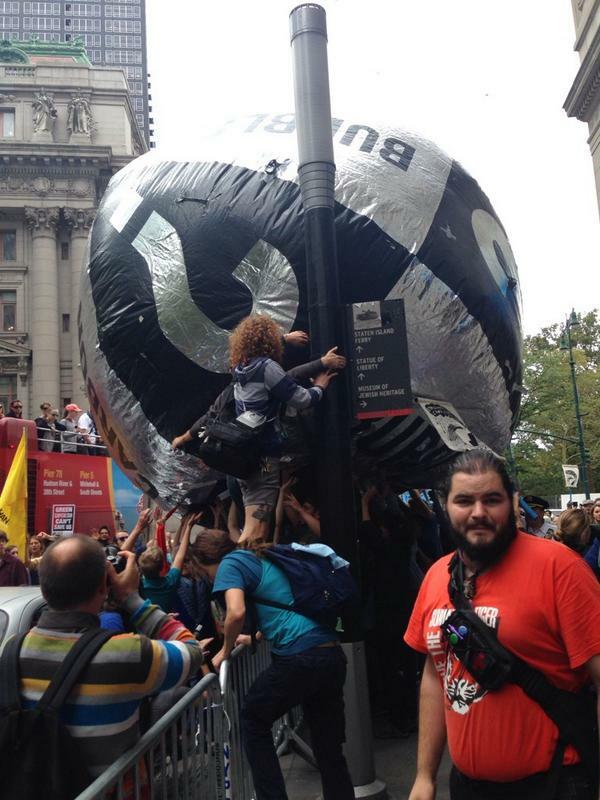 Demonstrators are restless as the march appears delayed in places, Nicolás Medina Mora reports.